Why Choose Nihi Sumba Island? Though you may be mistaken for thinking Nihi Sumba is one of the fifty Eskimo words for snow, what if we told you it’s actually the Best Hotel in the World (as voted by Travel + Leisure Magazine) and that you can spend a week or two indulging yourself to the max in paradise with no guilt whatsoever? 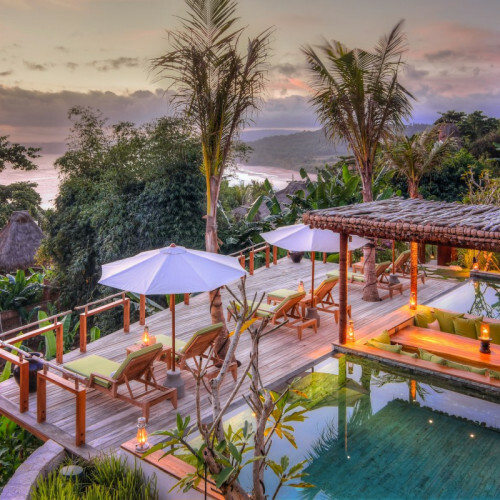 Nihi Sumba Island is the brainchild of Chris Burch who invested $30 million transforming the cult surf destination into a boutique, five-star resort… in heaven, just west of Paradise… on the remote island of Sumba, Indonesia. Described as “Asia meets Africa”, the island’s hidden waterfalls, scenic ocean views and authentic rice paddies are the perfect hub from which you can immerse yourself in luxury spa pampering, adventure, exotic Sumbanese culture, bush-cooked meals, and something almost impossible to find anywhere else on the planet… absolute bliss! In 1988, Claude and Petra Graves in search of the perfect wave, found Nihi Sumba Island (or “mortar stone” as Sumba’s ancestors, the ‘Marapu,’ named the beach centuries ago) and vowed to turn it into a resort that would preserve and share the breathtaking beauty of Sumba with those who would truly appreciate it. People like you. And the best thing is, since 2001, profits help foster community-based projects via Claude’s philanthropic Sumba Foundation. 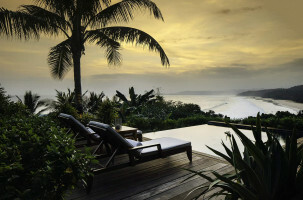 This means that as you laze in your own million dollar, Indonesian African Bush-style clifftop treehouse villa overlooking the Indian Ocean, or private villa plunge pool, indulge yourself in day-long spa safari with endless spa treatments, ride horses at sunset along the beach, fish for big game, catch some surf, chill at Coconut Cove or make chocolate in Charly’s Jungle Chocolate Factory… you can rest assured that you’re also helping community-based projects on Sumba! Nihiwatu - The Best Hotel in the World.